Recombinant gas Sun Xtender? 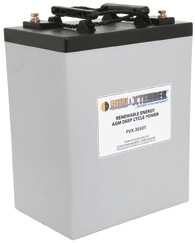 Series solar batteries are low resistance, valve regulated lead acid (VRLA) batteries. PVX-3050T used for applications such as Street & Bus Stop Lighting, Cathodic Protection, Grid Tied & Off Grid Homes, 2-Way Radio Repeaters, SCADA, Navigational Aids, Medical Refrigeration Clinics & Power for Remote Areas / Developing Nations. WE WILL NOT BE UNDERSOLD !